Chennai: Alianated DMK leader M K Alagiri today met his father and party chief M Karunanidhi here amidst speculations about his return to the party fold. 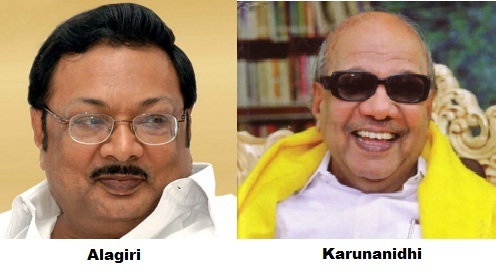 Alagiri called on Karunanidhi at his residence and also met his mother, Dayalu Ammal. While his brother and DMK treasurer Stalin told the media that nothing much should be rerad in this meeting, party spokesperson TKS Elangovan told journalists that Alagiri’s reinduction in DMK depends on the party high command. Alagiri’s son Dhayanidhi posted on twitter that his father had met the DMK chief “to make amends”. Alaggiri, who has a strong politial base in Madurai and southern districts of Tamil Nadu, was dismissed from DMK for anti-party activities in 2014.